This review of Alphabet Glue e-magazine is part of the Second Annual Natural Parents Network Holiday Gift Guide hosted by Natural Parents Network! I am bringing you FIVE Gift Guide reviews over a span of several days — so read about these products I love, and then come back to enter the giveaways on November 6. I solicited the prizes I'm reviewing specifically because I knew my family already loved them or because they were right up my kids' alley. I'm so pleased to present them to you over the next five days! And I'm not the only one who got to review amazing, eco-conscious, mindful, and natural products: A whole crew of our NPN volunteers did, too! If you need to complete your holiday shopping, find a birthday present for a friend, or just treat yourself to something special, the NPN Holiday Gift Guide has something for everyone. But what's even better, the NPN Holiday Gift Guide is a great opportunity to shop consciously and to support many naturally minded small businesses. The 55 companies that have provided items for review and giveaway are almost exclusively made up of work-at-home shops or companies that are dedicated to supporting eco-conscious choices. I'm featuring one of those companies in my review below. When you get done reading my review, please click on over to the full Second Annual Natural Parents Network Holiday Gift Guide, where you'll find information on 58 products. In total, we're giving away goodies worth more than $2,500! Even if you don't win one of our fabulous prize packages, please consider spending part of your gift-giving budget at one of these small businesses. By supporting small businesses, you are helping families, boosting local economies, and supporting ethical practices of manufacturing, production and selling. Take advantage of coupon codes provided by many of the companies. You'll be able to find them at the full Gift Guide when it publishes November 6. 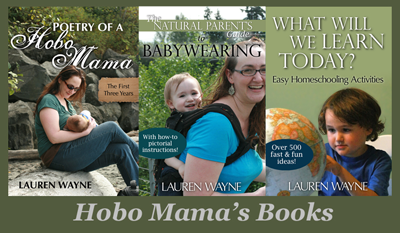 This is a joint review and giveaway of Alphabet Glue between Natural Parents Network and Hobo Mama. Then you will want to hear about our experiences with the e-magazine Alphabet Glue! Each seasonally thematic PDF issue is full of charming photographs, exciting science experiments, literary-themed crafts, story-building activities, and related booklists to further the love of reading. This e-magazine would be a perfect gift for a family interested in homeschooling or extending natural learning into their everyday lives. I reviewed Alphabet Glue glowingly before, so I'm cutting and pasting a lot from that post! From the summer issue, Volume Thirteen (included in the 5-volume giveaway bundle), the boys and I decided to do an experiment from the PDF pages: Monster Toothpaste. The name alone makes you want to try it out, am I right? That's some snazzy monster toothpaste! We made it into a sensory project. only monsters would use this as toothpaste! I'm really impressed with the quality and variety of Alphabet Glue. The photos and layout are gorgeous, with plenty of delicious white space, so it's a feast for the eyes. Each issue includes science- and art-themed projects, as well as lists of children's books that tie in with the topics and literary-themed projects as well (such as making mini-books). As a book nerd and a writer, I love how oriented this magazine is toward reading and storytelling. 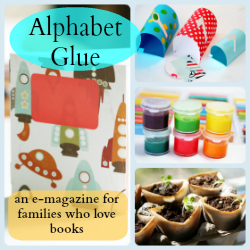 If you want simple and natural ideas for engaging your kids' interest in books, science, and art, you'll love having issues of Alphabet Glue on your computer, e-reader, or smart phone! You can buy individual issues of Alphabet Glue for $4 at AlphabetGlue.com or issue collections at a discount, so it's really easy and affordable. I also think it would make a wonderful holiday gift: eco-friendly, small-biz-supporting, creativity-inspiring, educational — and fun! Any homeschooling or unschooling family in particular would love it! Enter "twenty" at checkout for 20% off any and all issues or bundles. For your own chance to win 5 e-Volumes (11-15) from Alphabet Glue, or one of the 26 huge prize packages we're giving away, come back to this post on November 6 when our Rafflecopter widgets will go live for your chance to enter! Or you can visit the full NPN Holiday Gift Guide from November 6 on to see and enter to win all of our fantastic prize packages at once!